While tiger print and leopard print are going still strong, we’re feeling a subtler approach to animal print—and so are many of our sisters in social media. While the ‘gram has gone increasingly beige recently with the proliferation of fashion accounts that favor a concise palette of brown, tan, and white—with that came a more creative and textural approach to these hues. Enter: the snakeskin print. On pants, dresses, and tops, it maintains a neutral disposition while adding an interesting pattern. As a bonus, you get all of the appeal of snake with none of the guilt—this is a print after all, not the real deal. 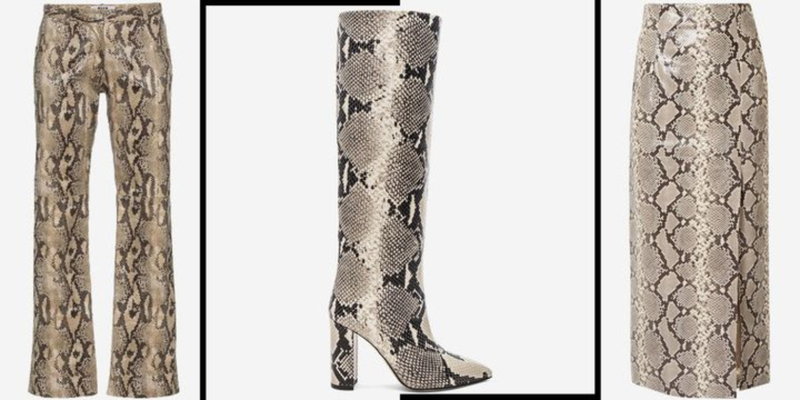 Let’s take a walk down snakeskin lane. Christie of NYCBambi pairs MSGM trousers with a camel coat and white boots for a streamlined look with high impact.